I got this idea on how to make this meringue ghost from Jane's corner, but I did not use her recipe (I use the earlier ice cream cookie recipe which taught by Felvinc) and method (she leave the meringue in the oven and door open for overnight) as humid air here will cause the meringue absorbed the moisture and turned sticky very quickly. Anyway, Thanks to Jane for sharing this great idea. 2. 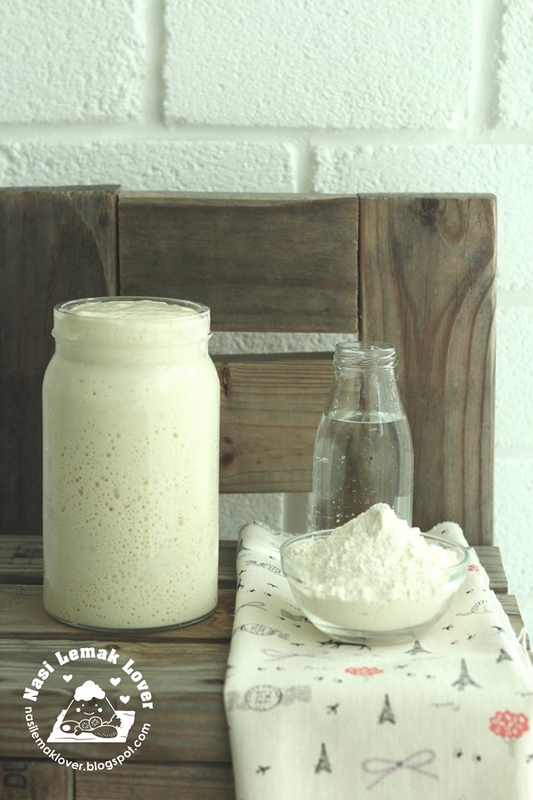 Beat egg whites and cream of tartar on low-medium speed until foamy. 3. Add the sugar, a little at a time, and continue to beat until the meringue holds soft peaks. 4. Add in corn flour and vanilla essence, continue to beat until very stiff peaks. 5. 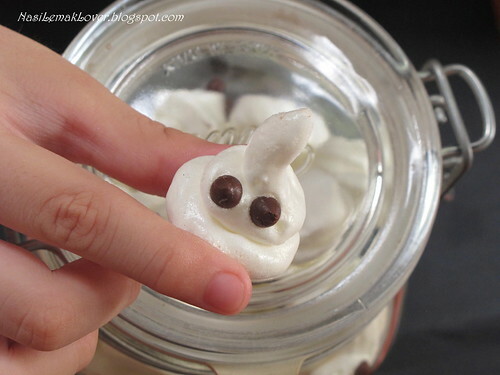 Pipe meringue into small ghost shape and carefully place two chocolate chips into each meringue ghost. 6. Bake at pre-heated oven at 70c for 90mins or until they are dry and crisp to the touch and easily separate from the parchment paper. 7. Immediately transfer the baked meringue into air tight container (to avoid meringues became sticky and gooey). 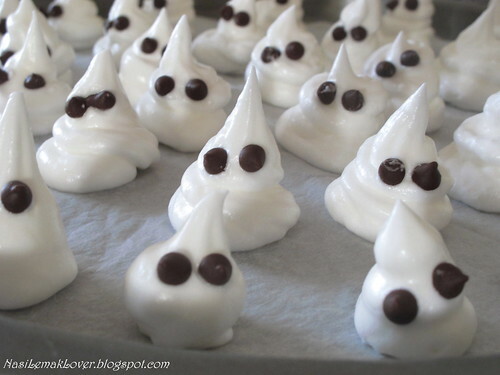 ** Desmond was so happy to enjoy this cripsy and sweet meringue ghosts !! Happy Baking and Happy Halloween !! Very nice Sonia! Love the idea! Too bad this year I am not baking any Halloween stuff for my girls. Your boy is right about going to US to enjoy Halloween, bcos they go all the way, no expense saved. And it is known that kids in States love halloween more then any other holidays (maybe besides xmas), because they get to dress up, go out at night which is pass their bedtime and eat as much candy as they like!! How cool is that? Talking about that, I sure miss my life there, lol! Happy Halloween! So cute! Haven't actually tasted Meringue before..does it taste sweet? Ha ha ha, cute halloween meringue! Haha... so funny that your boy has such request! 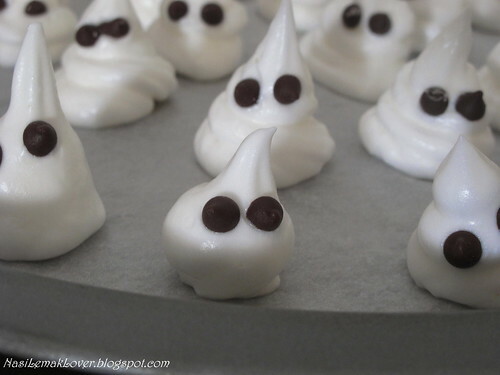 Those meringues are such cuties! Thanks. Have a great weekend. They're friendly ghosts, Sonia! So cute and edible too! Your son is so funny! You are very sweet mom Sonia ! Very cute and I bet Desmond loved them. Wow...this is too cute! I have to try it. i followed the entire recipe, but it turns out to be liquid..and can't stand up to become the lil ghost..
Lovely idea for Halloween. I myself actually am never into Halloween despite my stay in the States. My fave holidays there are Thanksgiving, Christmas and Fourth of July. How cute! Happy Halloween :)! The "ghost" looks cure and friendly. Dear all, Thanks for stopping by.Ya, this meringue ghosts are too cute..
Bee Bee, I know you miss USA very much, hehehe..
Melodii, did you beat egg white till stiff peak? did you bake very long hour on low temp? i dont know what was your problem, this recipe is work for me, maybe you should try again..